last year the united nations declared june 8th as world oceans day; according to the portal of all knowledge, the idea of a annual celebration of the oceans was first proposed on june 8th 1992 at the earth summit held in rio de janiero. this year the theme for world oceans day is oceans of life. if interested you can learn more about world oceans day and see if there is a special event near you by visiting the ocean project website. not surprisingly, there are lots of happenings in ocean states - such as california, connecticut, massachusetts and florida - but even some land-locked states are holding special events. nothing in ohio, hey, what's with that didn't anyone get the memo! there is something healing and centering about being near the ocean. I miss living near the seacoast; sometimes I fool myself by saying that living on the banks of a great lake is a good substitute. however, when I actually make it to the ocean I realize there is nothing like the real deal! unfortunately because of human activity and thoughtlessness, the oceans and all the creatures that live in the oceans are constant in peril. forgiveness from mother ocean/mother earth only can go so far. 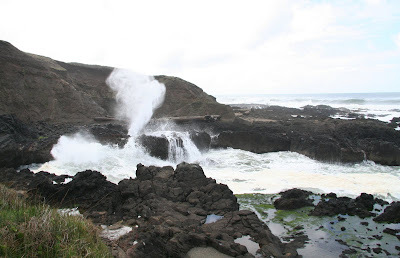 today's photos were taken in late april during a hike along the oregon coast at siuslaw national forest and show a spouting horn, which is a natural fountain driven by the power of the ocean. pearl jam's song oceans. the song was performed first in 1991 and released in 1992. There's just NOTHING like the ocean! It can stir up any emotion you wish it to. Lovely photos! Yup! It's why I live where I do. I am only really at ease and happy when I'm by the sea. I adore it with every fibre of my body. So I live in a city! One day, one day I'll get to live on the coast again. I don't care where: UK, US, France, wherever. 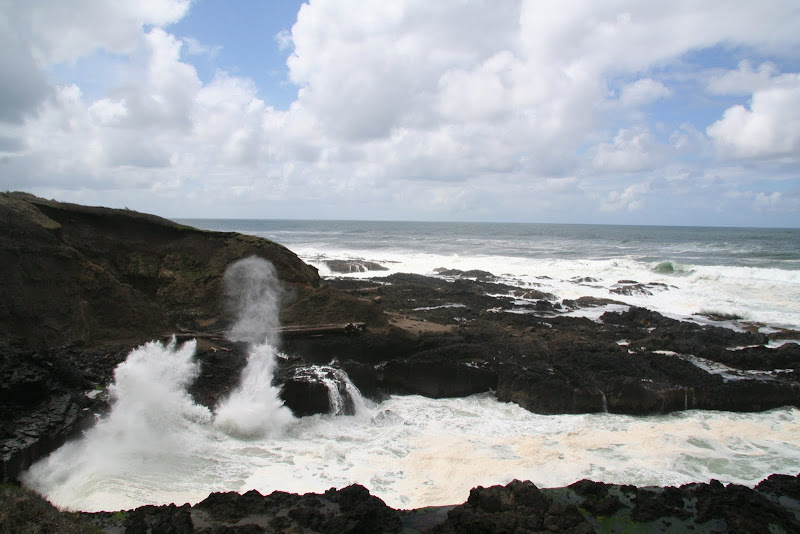 I can actually calm myself in the middle of the maelstrom known as city life by dreaming about waves crashing onto shorelines; I conjure up the ozone smell and the sounds of the sea and the white horses arriving one after another . . .
Hark at Dumdad! He's been at the strong cheese again. I love the smell as the road gets close to the Pacific. Then the first sight of the surf. I find it hard to leave once I'm there. Yep. They're going to have to drive me out of California with pitchforks before I'll leave the ocean! I shall put my celebration of World Ocean Day off until next week when we are heading down to the south coast. Not sure whether the English Channel qualifies as an ocean, but they all join up eventually don't they. planning on gulfing it next summer, 25th anniv coming up, been too long. Of course, it seems this isn't a good year for beach goers...the news just gets sadder and sadder.